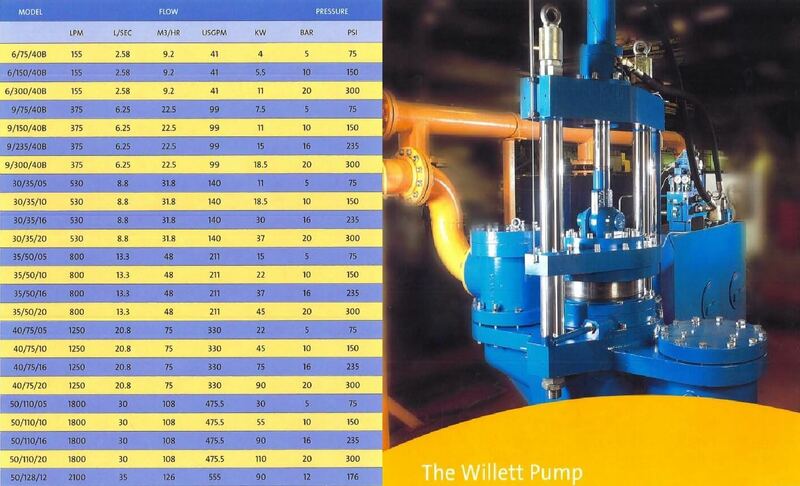 The Willett Pump is a single acting, hydraulically driven, reciprocating piston or ram pump. In operation, the suction (upward) stroke of the pump opens a large bore suction check valve, drawing material to be pumped into the barrel of the unit, and the delivery (downward) stroke closes the suction check valve and opens delivers the material through the discharge check valve to the filter press. Because of the materials used in construction and the lack of close fitting wetted parts, the pump is uniquely suitable for handling highly abrasive materials. Because of its relatively gentle pumping action, it is also well suited for the handling of delicate flocculant type materials, avoiding the break up and consequent deterioration of dewatering characteristics of such materials inherent in many other pumping systems. Motive power to flow control pumps used for filter press feed service is normally provided by an electric motor-driven hydraulic power pack. Use of hydraulics for this purpose allows the pumping characteristics of the unit to be easily tailored and adjusted to the specific needs of the filtration process. 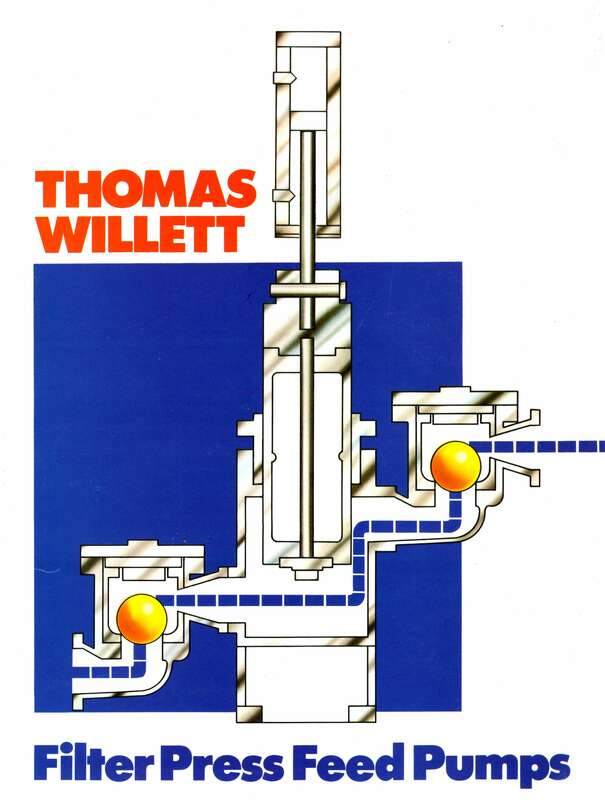 The body, or barrel of the pump has been designed to be cast as a single piece, even in the largest of pumps, to provide the rigidity needed to ensure long, maintenance-free operation. For normal service this body is manufactured from close-grained cast iron, having the advantages of robust construction and excellent wear resistance properties. Where special conditions are involved, the unit is also designed to be lined with materials such as rubber or neoprene or to be cast from stainless steel, a variety of copper bearing alloys, or from cast steel. Materials of construction for the piston or ram of the pump can also be tailored to the specific corrosion/erosion characteristics of the fluid to be pumped. A highly durable and corrocion resistant Ceramic Ram is available, or a High Chrome Cast Iron Ram, with exceptional abrasion resistance, in standard Grade 17 Cast Iron.